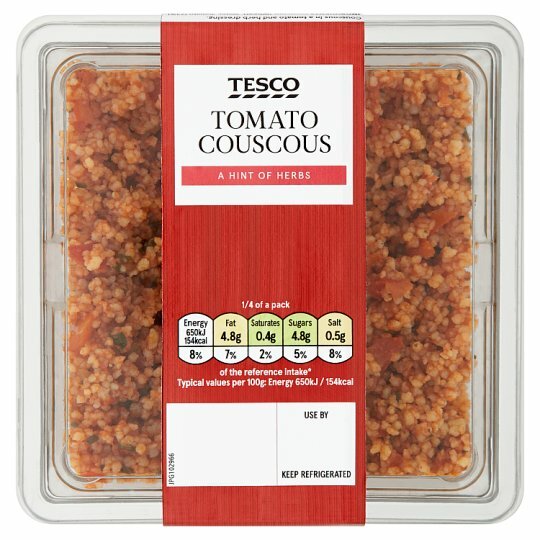 Couscous in a tomato and herb dressing. A hint of herbs. Fluffy couscous tossed in chopped tomatoes with parsley and oregano. INGREDIENTS: Couscous (Wheat), Water, Tomato (23%), Tomato Purée, Tomato Juice, Rapeseed Oil, Onion, Sunflower Oil, Concentrated Lemon Juice, Parsley, Red Wine Vinegar, Salt, Black Pepper, Cornflour, Oregano, Garlic Purée, White Pepper.